Title text: I'm working on assembling a combination declinometer, sclerometer, viscometer, aleurometer, stalagmometer, and hypsometer. I'm making good progress according to my ometerometer, a device which shows the rate at which I'm acquiring measurement devices. Here, Megan is talking to Cueball about hygrometers. But before she can even finish explaining what it does, Cueball has looked up, found, and purchased the product. A hygrometer is an instrument for measuring the amount of water vapor in the atmosphere, or the amount of water in solids such as soil or wood. It seems Randall (or Cueball) loves being able to measure things and therefore finds instruments or measurement tools that end in -ometer very interesting, and wishes to own all of them. Many measuring instruments use the suffix -meter which is derived from the Greek noun μέτρον for "measure". The character "o" always belongs to the first term, but it also belongs to old Greek words like thermo-meter, micro-meter, or even hygro-meter. Other measurement devices such as speedometer use an English word with an "o" appended to mimic the Greek derived terms, purportedly for easier marketing. Because themes in science often based on Greek terminology that ending at the first part appears often. Nonetheless Randall believes that this "o" belongs to the general term for measuring devices. A declinometer is an instrument to measure magnetic declination. A sclerometer is an instrument to measure scratch hardness of a solid by scratching it under some standard conditions and measuring the scratch. Instruments used to measure the elastic properties of concrete surfaces, like the Schmidt hammer, are also often known as sclerometers. A viscometer is an instrument to test the viscosity (difficulty of pouring) of a liquid. For example, honey has higher viscosity than water. An aleurometer is an instrument to evaluate the quality of flour for baking by measuring how much a wet mass of wheat can expand when heated, while keeping its adhesivity. A stalagmometer is an instrument to measure surface tension of fluids by producing a drop and weighing it - the bigger the drop is, the larger surface tension the fluid has. The word hypsometer could refer to either of two unrelated instruments to measure height. One measures heights of a building or a tree by triangulation. The other measures altitude by measuring air pressure through its effect on the boiling temperature of water. It should not be confused with the altimeter which measures altitude by mechanically measuring air pressure (and which also does not follow the -ometer rule and might therefore be of less interest to Cueball? Is that the reason why Cueball appears in a diagram at the Wikipedia page for hypsometer but not for altimeter?). 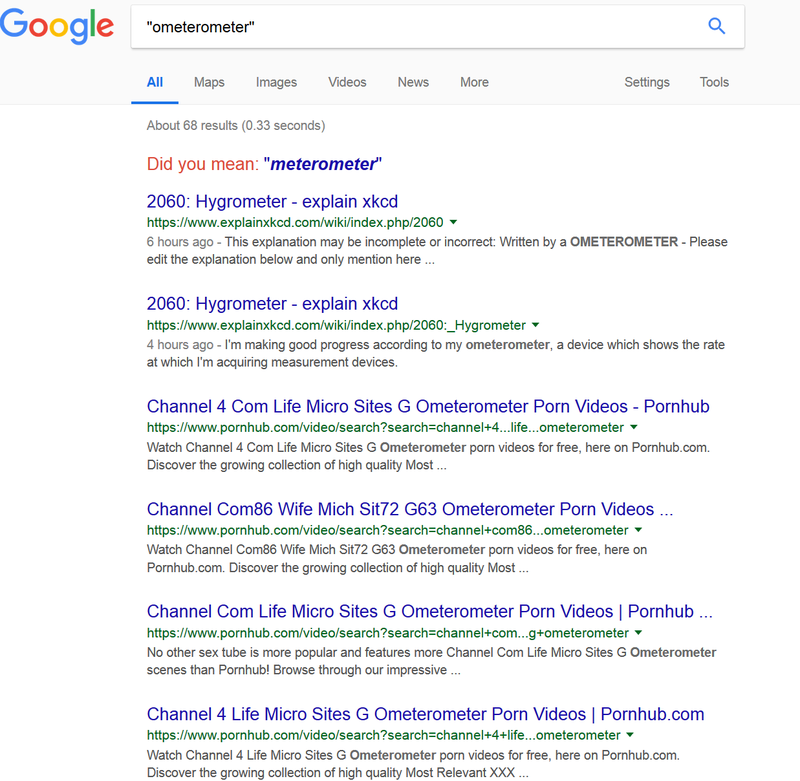 Finally he mentions an ometerometer, a concatenation of -ometer with itself, which would be a device for measuring measuring devices. It has been included in a humorous list of Other Types of Ometers from 2007, where it was described as measuring the measuring capacities of other measuring devices. Cueball: I want one! Ooh, found one for $7.99 with free shipping! I'm buying it. For some reason, I feel a powerful compulsion to own any device whose name ends in "-ometer." This page was last edited on 4 January 2019, at 07:27.